Gerber 100% Organic Apple Juice comes in four-ounce bottles, making portion control easy. As the name implies, it’s all juice, with no sugar or sweeteners added. Because it only requires refrigeration after opening, it’s easy to pack in your diaper bag to go. 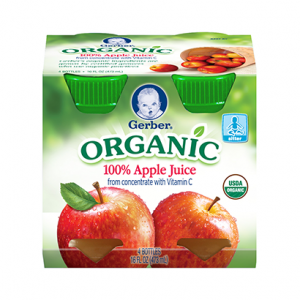 A four-pack of Gerber 100% Organic Apple Juice costs around $5 in stores and online. Visit Gerber.com for more information.